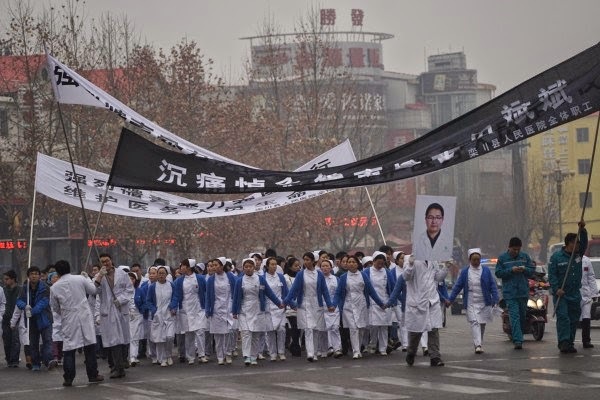 The medical news in China has been dominated this week by the death of a doctor at a Luoyang hospital after a brawl with a drunken patient. Both fell down a lift shaft and were killed. It's just the latest in a long line of violent incidents against medical staff. Each time one occurs there are protest by staff, stern editorials in the media and vows to crack down on such incidents. There have even been gimmicks, including plans to have 'volunteers' or police patrols in hospitals to defend doctors from violence and defuse violent situations And yet still they continue. I can't understand why Chinese hospital don't have 'crash' alarms like they do in western countries, that trigger lockdowns and mutual protection protocols. On a more positive note, Chinese drug makers have registered the world's first Sabin-inactivated poliovirus vaccine (S-IPV). The vaccine, developed by the Chinese Academy of Medical Sciences is being produced by the Institute of Medical Biology within the Kunming Hi-Tech Zone. It is said to be more effective than the current oral polio vaccine and also inexpensive. Such a vaccine may have a role in remote parts of China such as Xinjiang, which recently reported an outbreak of polio. After more than a decade being polio free, in 2011 there were 23 polio cases reported, 55% of which were in young adults. The polio was presumably brought in from the neighbouring Muslim state of Pakistan, where polio has not been eradicated due to the Taliban. Another first for China this week was the first patient to be treated - and survived - a new H5N6 strain of avian influenza. The patient treated by well-known specialist Dr Zhong Nanshan at Guangzhou hospital after contracting the infection from - guess where - a live poultry market (why don't they just shut them down for good?). Dr Zhong said this was the second patient to contract the dangerous infection - the first one died. he said the second patient had been treated with high doses of antivirals and was in a stable condition. China is also struggling with a winter outbreak of H7N9 avian flu, with 30 cases so far around Guangdong. In the healthcare reforms, some healthcare managers have said that hospital reforms should focus on the model of funding, and switch to an 'activity based funding' system to reward outcomes. At a meeting of the Beijing Chinese Peoples Consultative Committee they said that the funding system based on "diagnosis-related groups" (DRG) would "break the link between doctors' incomes and prescriptions, thereby preventing excessive medical treatments and over-prescription of drugs." Hospital managers complained that they were underfunded because fees had been fixed at low prices set in 1999 whereas costs (and incomes) had risen considerably since then. Well, fees may be too low according to hospital managers, but some patients still can't afford them. A woman has made news in Kunming by dressing up in a wedding gown and offering herself for marriage to any man who will pay her brother's medical fees. Her brother has leukaemia and she says he needs 300,000 yuan for treatment. China is supposed to have a public health fund for people with catastrophic illness, but it obviously hasn't trickled don to this young man.